Abby the Librarian: AudioSynced July Roundup!! Remember that Sync has free audiobook downloads every week this summer! One of this week's offerings is The Hunger Games by Suzanne Collins, so hurry over there before August 4 to get the mp3! Mary of Audiobooker linked to Full Cast Audio's YouTube channel, where you can get a glimpse inside the audiobook recording studio. I love getting the inside scoop on the process behind creating audiobooks! 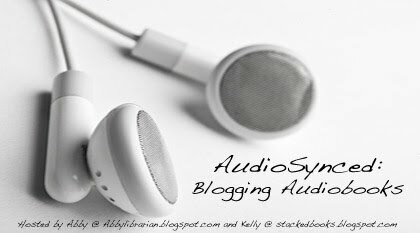 Check out Mary's blog for lots more links and info about audiobooks. Susan of Audiobook DJ pointed me to Crossroad Press, an audiobook publisher looking to build a network of blog reviewers. Interested in reviewing Crossroad Press titles? Check out their website for details! Kelly told me about We Read 4 You, which looks to be a new audiobook distributor launching this month. If nothing else, you can register for a chance to win an iPod shuffle or free audiobooks. Nick Owchar of the LA Times reviewed several audiobooks in his article Summer Listening. Publisher's Weekly has a fairly comprehensive preview of some of the audiobooks coming out in Fall 2010. I've got a review of Strider by Beverly Cleary, read by George Guidall (Recorded Books, 1992). Brenda of proseandkahn reviewed a TON of audiobooks this month, including The Red Pyramid by Rick Riordan (read by Kevin R. Free and Katherine Kellgren [!! ]), Gossamer by Lois Lowry (read by Anne Twomey), The Summoning by Kelly Armstrong (read by Cassandra Morris), and Keeper by Kathi Appelt (read by the author). She's got reviews of children's, young adult, and adult titles, so make sure you click through and check those out! Lee of Reading With My Ears reviews Falling In by Frances O'Roark Dowell (read by Jessica Almasy) and The Witch of Blackbird Pond by Elizabeth George Speare (read by Mary Beth Hurt). Lisa of Shelf-Employed reviews Peace, Locomotion by Jacqueline Woodson, read by Dion Graham (Brilliance Audio, 2010). She says, "The challenge of narrating a novel consisting of letters from only one person is a great one, and Dion Graham's reading rises to the test." Mel of Mel's Books and Info reviews Shade by Jeri Smith-Ready (read by Khristine Hvam), Sisters Red by Jackson Pearce (read by Erin Moon and Michal Friedman), and White Cat by Holly Black (read by Jesse Eisenberg). Susan of Audiobook DJ reviews The Not-Quite-Right Reverend Cletus J. Diggs & the Currently Accepted Habits of Nature by David Niall Wilson, read by Joe Goeffrey (Crossroad Press, 2010). She says, "Narrator Joe Geoffrey does his part to make this unlikely story come to life. His work especially shines when voicing the good ol’ boy characters that Cletus enlists to help him investigate the mystery." Undaunted Courage by Stephen Ambrose, read by Barrett Whitener. Amanda of A Patchwork of Books gives us mini-reviews of several titles, including Girl in Translation by Jean Kwok (read by Grayce Wey), Every Last One by Anna Quindlen (read by Hope Davis), The Short Second Life of Bree Tanner by Stephenie Meyer (read by Emma Galvin), and The Little Giant of Aberdeen County by Tiffany Baker (read by Carrington McDuffie). Lee of Reading With My Ears reviews Death's Jest Book by Reginald Hill, read by Shaun Dooley. Kelly of Stacked reviews Goldengrove by Francine Prose (read by Mamie Gummer) and I Thought You Were Dead by Pete Nelson (read by Josh Clark). And that's all I've got for you this month! Did I miss something? Leave me a link in the comments or send me an email and I'll add the link. Didn't review or talk about audiobooks this month? No problem - Kelly will have another roundup next month at Stacked.